Legendary actor John Wayne in a clip from 1970 on the TV variety show he hosted celebrating America's history. 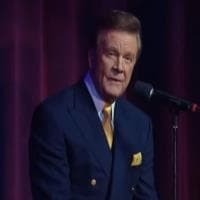 Many famous actors and actresses are featured in this video singing God Bless America including Ann Margaret, Lucille Ball, Jack Benny, George Burns, Johnny Cash, Roy Clark, Bing Crosby, Phyllis Diller, Lorne Greene, Bob Hope, Forrest Lewis, Dean Martin, William Shatner, Tom Smothers, and many more. What a classic video.